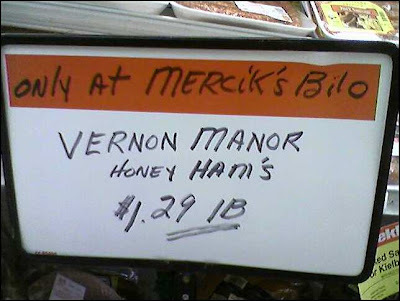 Matthew H. found these sweet Honey Ham's for just $1.29 lB in Bilo of Homer City ... the apostrophe abuse is included in the price, no extra charge. And Chris found a similar deal on ice at the Food Lion in Lusby, Maryland. Or is it actually LCE for $1.79/10lb? After spotting WOlFIE Van Halen's guitar and an offbeat poster for The Who with Roger DAlTRY, chalk up another lowercase L for reader Gary C., this time in Collingwood, Melbourne. Found in the Gem Bar, you can order an EMERSON'S OlD 95, but the locals might think you're making fun of their Australian accents. And the price is $ll ... isn't that $5050 in Roman numerals?